Jobs - Private Chefs Inc.
Hello job seekers or those of you just interested in seeing what is available! Our job listings are backed up with detailed job descriptions which we will share with you if you are potentially qualified. 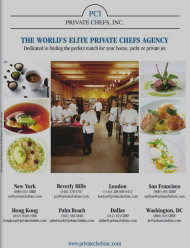 Not all the positions that Private Chefs Inc. represents are posted here. We search our data base of available candidates first when a new job order comes in. If you have private service experience, no background issues and the desire to be professionally represented, we would like to hear from you.